Matilda Lowther Photos, News, and Videos | Just Jared Jr.
Gigi Hadid is a rocker chick! The 21-year-old model showed off two grunge looks for the Versus Versace fashion show on Saturday (February 18) during 2017 London Fashion Week. Her little sister Bella also hit the runway. Spotted in the front row were Ellie Goulding, Jamie Campbell Bower and girlfriend Matilda Lowther, Dua Lipa, Noomi Rapace, Rocco Ritchie, Will.i.am, and Jourdan Dunn. That same day, Gigi promoted her new Tommy X Gigi collection at the Tommy Hilfiger store. Earlier in the week, Gigi and Bella joined BFF Kendall Jenner while leaving the Anna Sui fashion show during New York Fashion Week. Jenna Coleman wows in a stunning red top as she attends the Christian Dior Cruise After Party held at Loulou’s in London on Tuesday night (May 31). The 30-year-old actress was joined by Jamie Campbell Bower and his model girlfriend, Matilda Lowther, and actress Kiernan Shipka, who changed up her look from the presentation earlier in the night. Just recently, a tiny teaser for Jenna‘s upcoming ITV mini-series, Victoria, was released — and Jenna has blue eyes in it! Check it out below! Jamie Campbell Bower joins Godfrey Gao on the red carpet for FilmAid’s 2016 Asia Power of Film Gala on Saturday (May 7) in Hong Kong, China. The two The Mortal Instruments: City of Bones actors reunited for the event alongside Rebel Wilson and model Matilda Lowther. If you remember, Jamie played Jace and Godfrey was Magnus Bane in the 2013 movie, which was based off of Cassandra Clare‘s book of the same name. The movie also inspired the hit Freeform show, Shadowhunters. The guys of Lawson suit up sharp for the 2016 BRIT Awards held at the O2 Arena on Wednesday (February 24) in London, England. 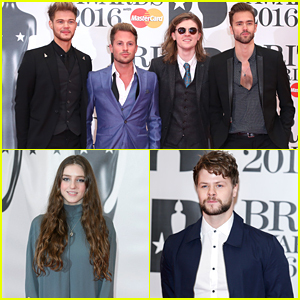 The guys — Andy Brown, Joel Peat, Adam Pitts, and Ryan Fletcher — hit up the annual show along with Birdy, Conor Maynard and Tom Odell. Strictly Come Dancing champ Jay McGuiness, George Shelley and model Matilda Lowther also hit up the awards, and did you see that Little Mix brought their moms as their dates? “Best performance of night @JamesBayMusic by far!!! Respect brother!! !” Lawson wrote on Twitter during the show, giving a shoutout to James Bay.